Bullseye is an elegant and flexible store locator software solution that integrates with any website. A flexible, responsive design that fits all devices from desktop to mobile. Easily implement your store and dealer locator on your device in minutes. Our platform works with any content management system or website builder. Get unlimited locations and categories for your brand’s store locator. We are continuously expanding our list of supported countries for radius search. Real-time search data in our sophisticated reporting and analytics dashboard. Configure a locator to match your brand, choose search and results data to display. Instantly detect a users location by IP or GPS when they arrive at your locator. Sophisticated engine which automatically geocodes on location upload or entry. 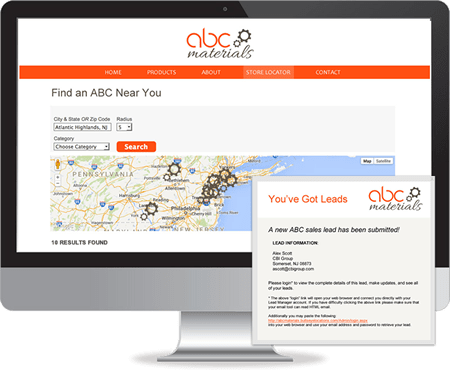 A powerful lead generation tool that captures leads directly from our search interface or integrates with stand-alone forms and routes to locations. Perfect for manufacturers, directories or any business that sells through a distributed dealer or agent network. Quickly get leads into the hands of your sales teams by configuring lead routing rules. Design your own branded email templates using our HTML editor. Route by territory, product selection, distance, responsiveness, round-robin and more; allow locations to login independently. Integrates with well known tools such as Formstack, Wufoo and Salesforce. 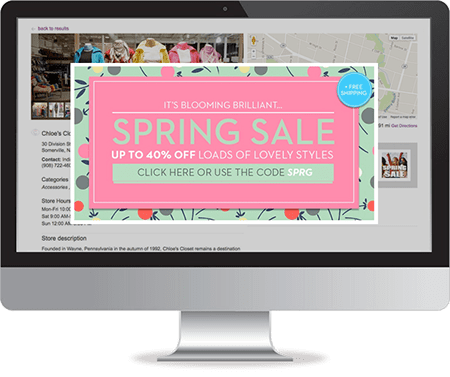 Supercharge your store or dealer locator with location-based offers and promotions that display dynamically based on your site visitors search criteria. Drive more in-store traffic with offers that give visitors increased incentive to purchase. Distribute location-based coupons to site visitors at the critical moment when they are searching for nearby locations. Flexibility to integrate with digital coupon printing like Qples, link to a landing page, or simply display a promo image. Easily assign promotions to locations individually or in bulk. Capture more local search traffic with Bullseye’s SEO optimized dynamic landing page technology. Great for franchises or retailers with multiple branded locations looking to increase search rankings. Quickly configure great looking landing pages with little or no technical knowledge. Centralize data management for hundreds, even thousands of pages. Include multiple location photos, unlimited content attributes, contact forms, events, promotions and social media links. SEO optimized pages use NAP schema markup. Customize page titles, meta descriptions, tags, and more. Get the word out on local in-store events with Bullseye’s easy-to-use event module and turn web searches into event signups. 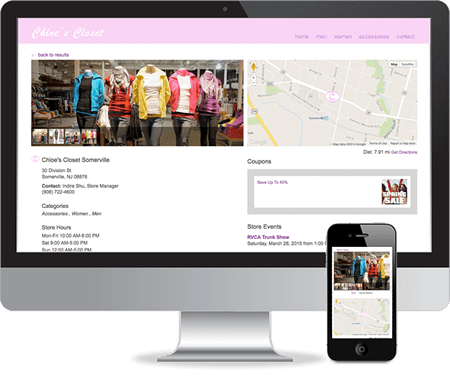 Drive greater event attendance by notifying website visitors when special events are happening at stores near them. Give your marketing team CMS tools for creating great looking, branded event landing pages with embedded maps and directions. Encourage sharing and leverage social media through integration with Facebook, Twitter and other social media platforms. Quickly setup and manage events through Bullseye’s easy-to-use event management module. Get the power of location! Bullseye Locations is the leader in integrated location solutions and turn-key store locator software, dealer locator software and store finder software. 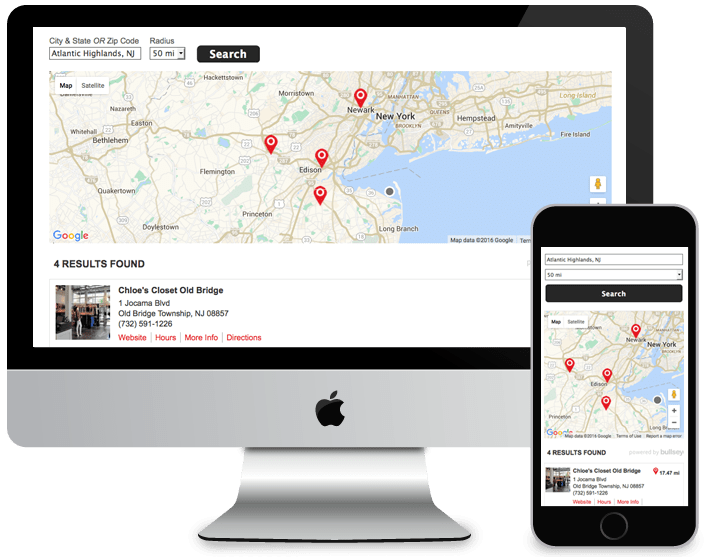 With top rated customer support, a robust feature set, an easy-to-use back-end interface, and a comprehensive API, Bullseye Locations offers location marketers all the tools they need to create and manage location marketing campaigns anywhere… including web, email, social, mobile and more. No Commitments. No credit card required.